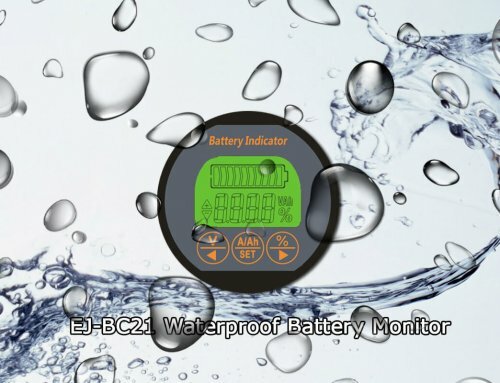 Voltage type LCD battery indicator, strip and digital synchronous instruction, from 0% -100 can display remaining battery capacity, precise and intuitive! F1: Backlight delay off: Enter a low-power state (<120uA) after display 10s. 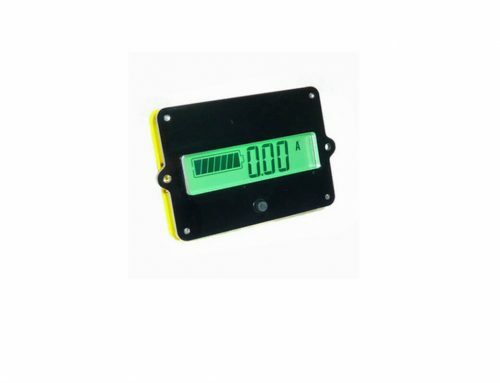 LCD display but backlight turns off. Press the OK key, backlight turns on 10s. F2: Dormancy: Enter a dormancy state (<15uA) after display 10s. LCD and backlight turn off. Press the OK key, backlight turns on 10s. F3: Backlight trigger: Enter a low-power state (<120uA) after display 10s, LCD display but backlight turns off. Backlight turns on 10s when voltage changes. Press the OK key, backlight turns on 10s. 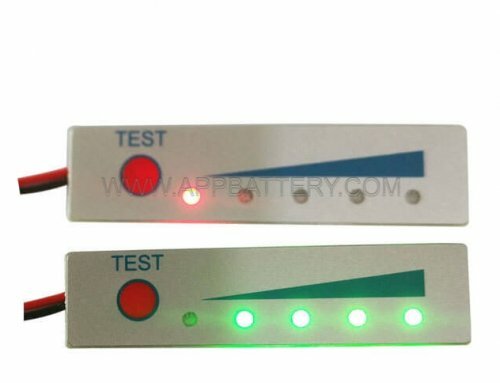 F4: Power on self test: When power on, LCD display strokes for 2s, then display the present battery type for 1s, finally display the electricity capacity. 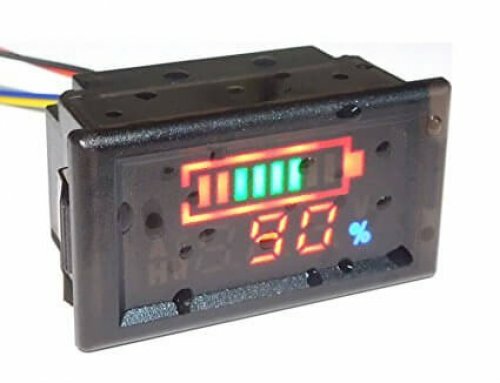 F5: Voltage display: The LCD display present voltage on the right. The battery symbol on the left still display. F6: Logo display: LCD show the Logo on the lower left. Note：Other specifications (1cell, 2cells and more than 15 cells) should be customized, and the specifications can’t be adjusted. 1. Open one rectangular orifice，one round hole and two screw holes on the panel of equipment according to the dimensions in the drawing. 2. Then install the battery monitor from the back of the panel in direction of the arrow. When turn off，hold down the “K-”key on the back and power on. 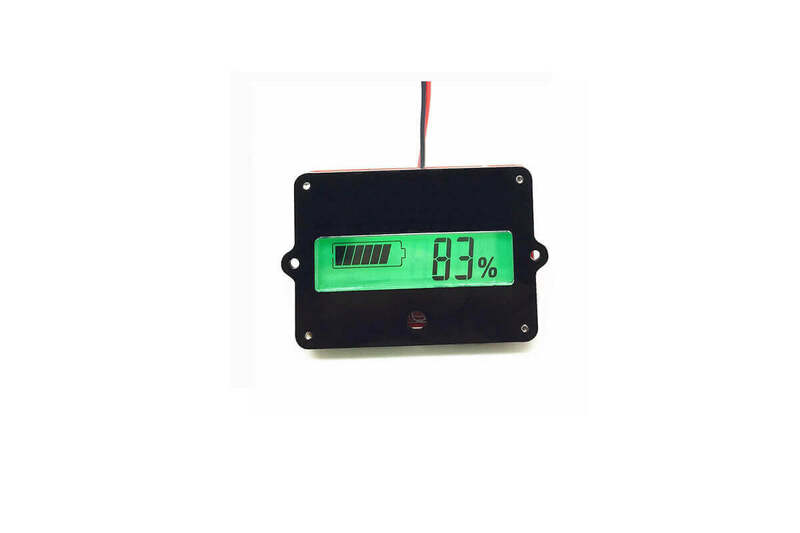 LCD displays the present specification. 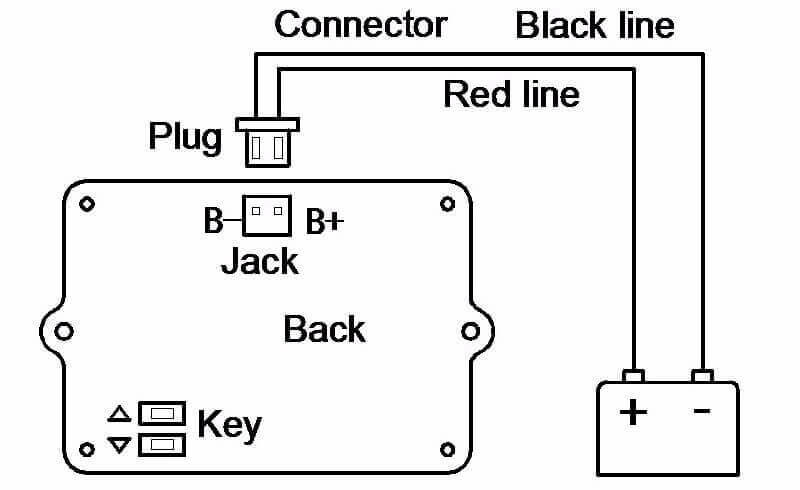 Use the “K+”key and“K-”key to adjust specifications, select suitable specification you need, then turn off and power on again. 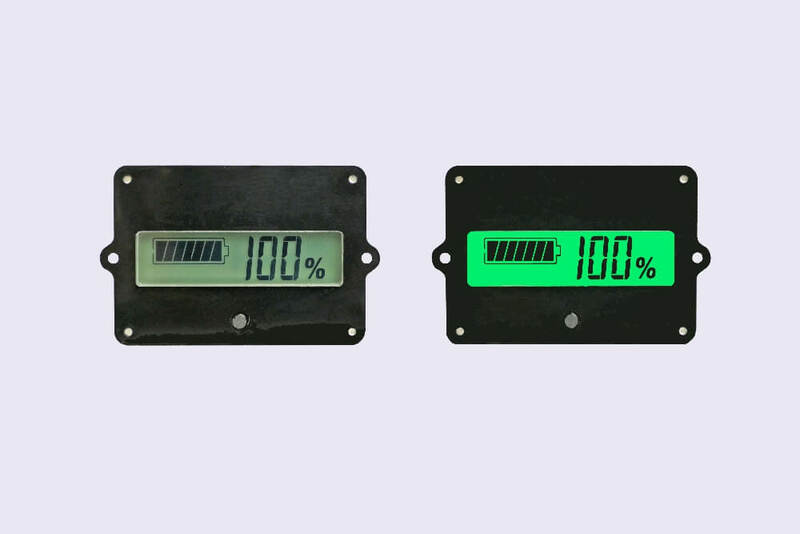 The battery monitor will be work normally (correspond code as below form). 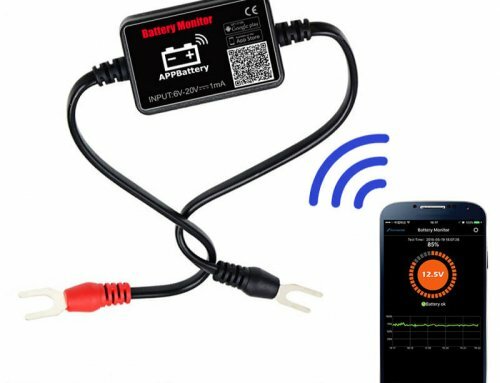 After adjust specification press the OK key, battery monitor enter the mode of set up. 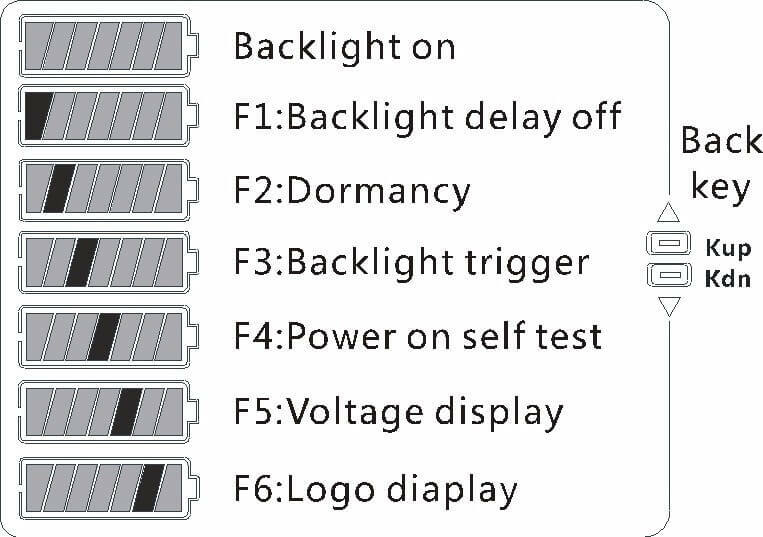 The segment code of battery symbol on the left display the present function, the right display F1~F6. Use the down key and up key on the back, users can select different functions from F1 to F6, then press the OK key and power on again, the selected function will run(as shown below).